Advameric offers a product line of milling CAD/CAM and NC verification software. 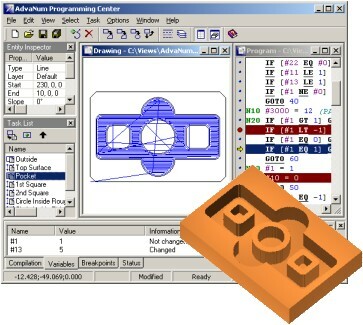 Using AdvaNum products you can create your own part drawings and easily convert them into CNC programs. Furthermore, you can simulate and verify created or imported G-code programs using tool path and realistic solid graphics models. You can debug programs in step-by-step mode while inspecting the resulted tool path, variable values and CNC status information. To get even more from your CAD/CAM software you can use advanced features such as cutting conditions optimization, macro-program library and sophisticated program editor. Try using our products before you buy them. You can download free fully functional evaluation copies of all products we offer. Our complimentary FREE NC Program Editor is also available to help you manually create and edit CNC programs. Advameric Services let you implement custom CNC solutions to meet your needs and requirements. Using our AdvaNum CNC Processor together with a third-party motion controller we can create a complete CNC system for you. We are building online version of our products. Check back later but for now please take a peak at how our online editor will look.